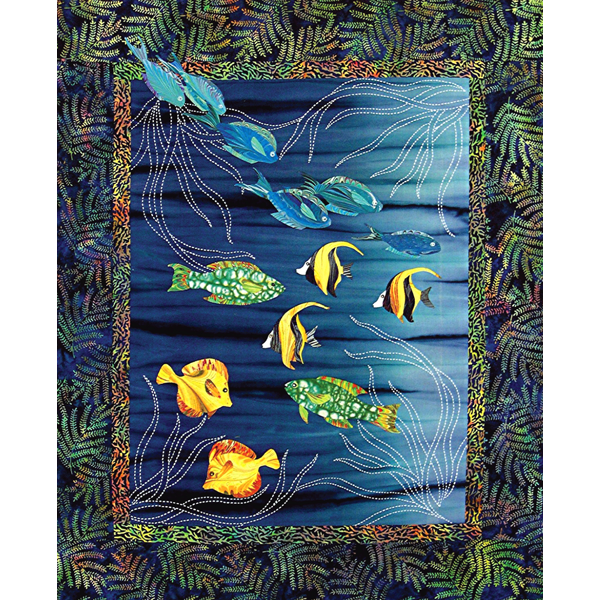 Capture a reef scene with appliqué and Sashiko! The Pacific Ocean around the Hawaiian Islands is an underwater garden full of reef fish as wild and exotic as any tropical flower. Moorish idols, wrasses and tangs are cut from Marjorie Lee Bevis marbled cotton. The sashiko sea grass pattern is turned 90 degrees and repeated in each corner. Learn pattern transfer, fabric selection, appliqué, sashiko, and finishing techniques. Can be adapted to machine or hand appliqué.